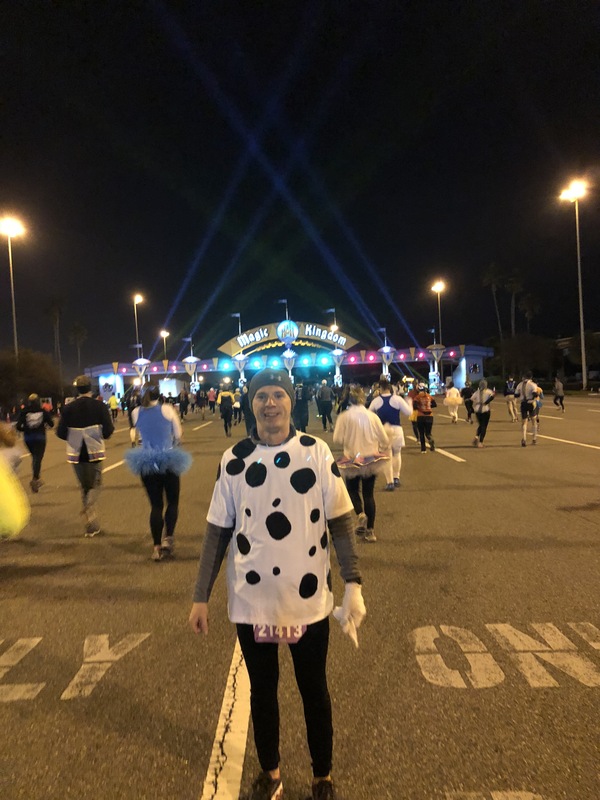 Note: if you’re just joining us, check out my recap of the 5k and 10k first. Thanks! As if waking up at 2:45AM for two straight days wasn’t bad enough, Saturday brought a 2AM wake-up call. 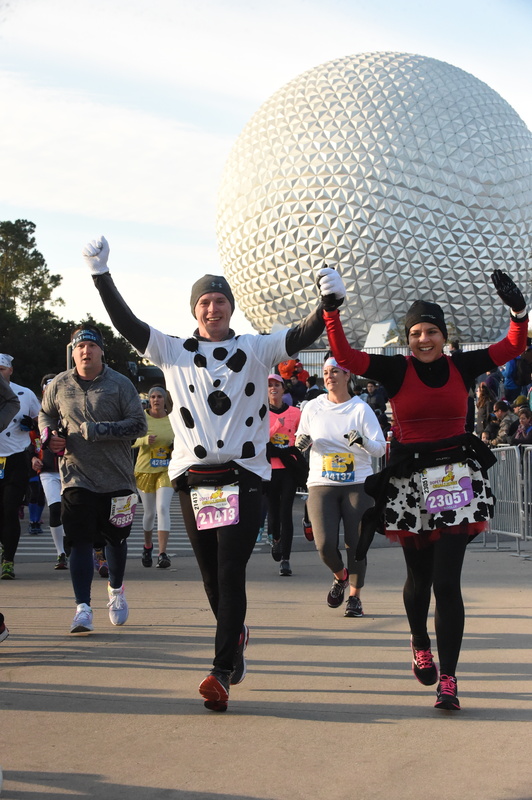 The half and full marathons are significantly larger races during the weekend, traffic is heavier, and roads around EPCOT (where the athlete village is) begin to close several hours before the race. So we needed to be up earlier to hit the road and ensure we were parked before the roads closed. Much like the previous two mornings, it was still bitterly cold that morning. It was just a touch warmer though, so we opted to check some warm clothes and I didn’t even wear sweats over my running tights. It was still friggin’ cold though! For this race (and the full) the corrals were in a different area, about 0.7 miles worth of walking. And, you had to be there much earlier than the first two races, so we ended up not sitting in our car as long as we did Thursday and Friday. After the videos and with a countdown from Donald Duck himself, our corral slowly started working its way towards the start. One thing that’s awesome about the Disney races is that every corral (and now every mini corral) gets its own send off, complete with countdown and fireworks. It’s pretty awesome! 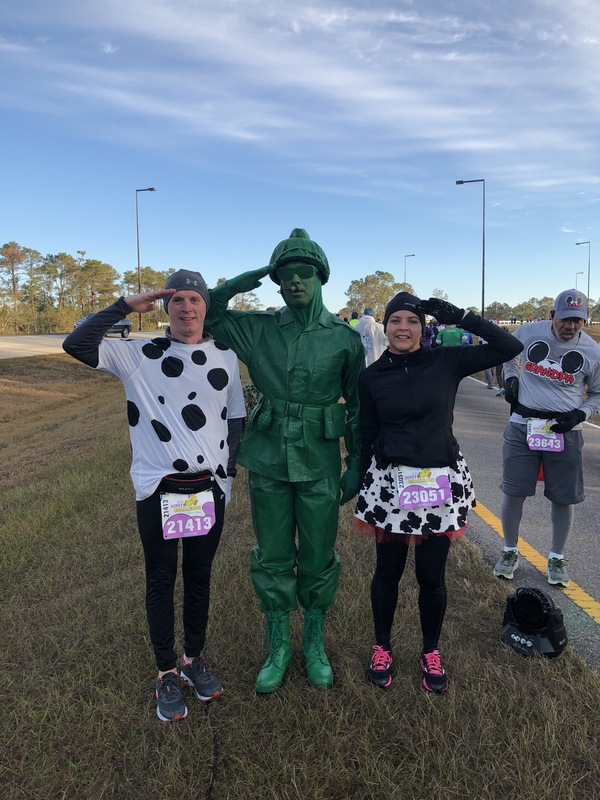 About 10 minutes after the first wave started, we crossed the line and began running down the road towards the Magic Kingdom! 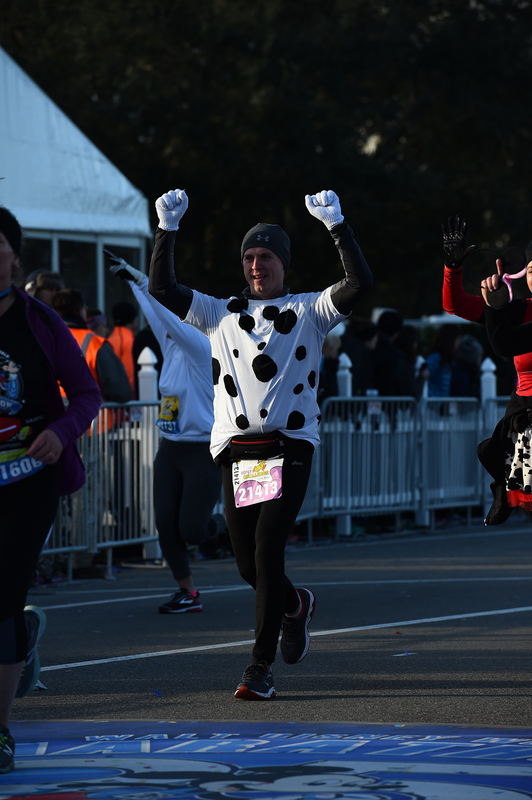 The course for the WDW Marathon Weekend half marathon essentially starts in the EPCOT parking lot, runs to and through the Magic Kingdom, and then returns to the EPCOT backstage area, into the World Showcase and finally finishing back in the EPCOT lot. We made it to the MK entrance feeling pretty good. We even dropped our cover-up clothes at that point, which we immediately regretted as we felt a chill from a few wind guests. 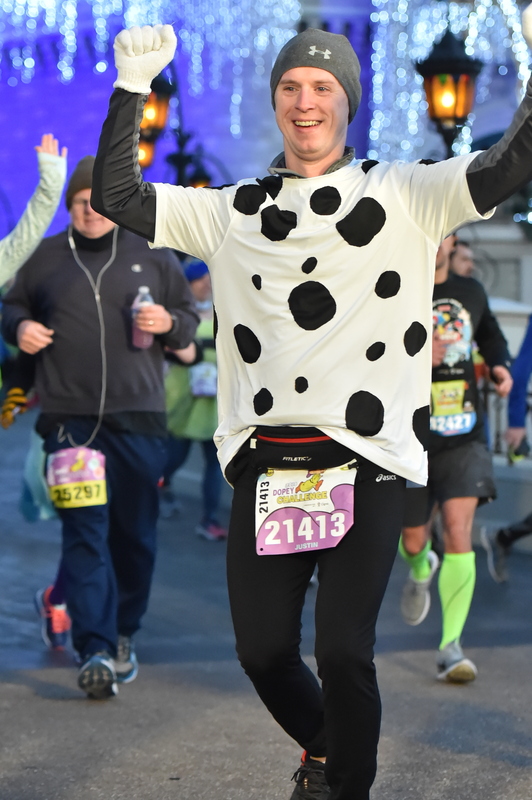 But the energy and excitement of running through that special place was amazing! Being essentially alone in the park, with the holiday lights still on, sent us good chills. When you leave the Magic Kingdom, you exit out to the side and go down a road. A very long road. A very narrow road. A very boring road. One that is filled with orange cones and barricades. Bob’s Barricades, as they have become known (although the cones this year were labeled Acme, so who knows what’s going on anymore). This can be a bit soul-crushing, and it’s very hard to maintain a run/walk because there are a lot of people and you’re running down a single lane of the roadway. I’m not going to lie, it’s bad. But eventually, you come back out onto World Drive (essentially the road to and from the Magic Kingdom gate) and head back towards EPCOT. At this point, Ro had to use the porta-potties, so we stopped. As soon as we stopped, I noticed a crowd and saw Captain Jack Sparrow and Barbosa, so I ran over to get in line. Ro came out just in time to join me for the photo before we hit the road again and began running up the off-ramp to Epcot Center Drive. On the ramp, I heard a voice barking out orders and motivation. Army Guy! With his words ringing in our ears, we headed to EPCOT and popped out near the UK pavilion and began running towards Spaceship Earth. 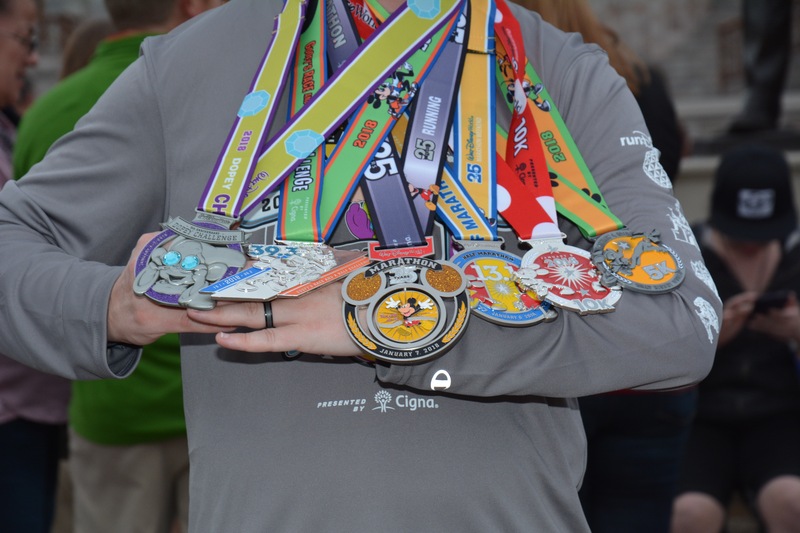 We grabbed our medals, our photos, our food, and our checked bags to put on some warm clothes. We also had a beer and champagne, but it was so cold we drank them quick and headed back to relax before a late breakfast at the Grand Floridian. 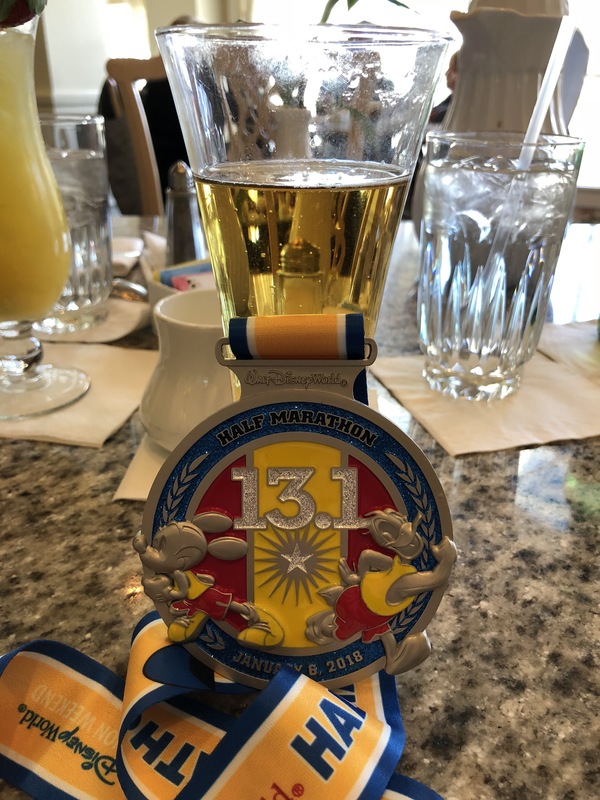 Three races down, one more – and the big one! – to go. 22.6 miles covered, 26.2 left. Tune in next time! 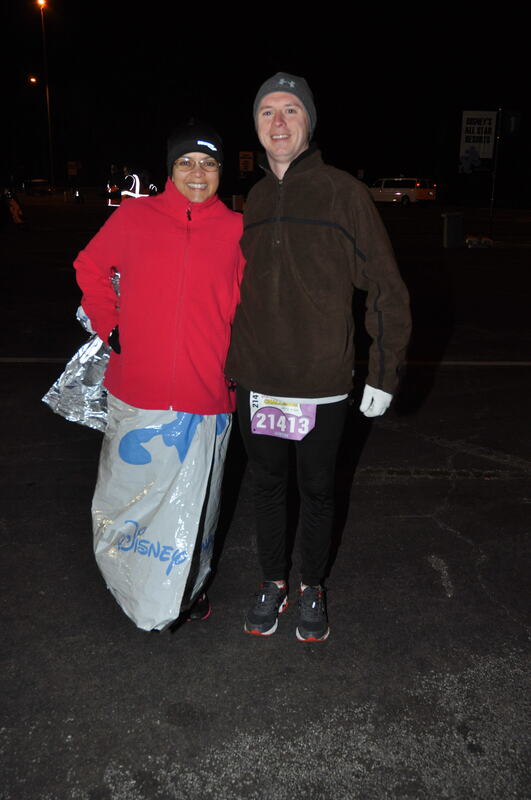 This entry was posted in Races, Running and tagged Dopey, race report, runDisney, Running by JB. Bookmark the permalink.